Electric cooker, microwave, fridge/freezer, dishwasher, kettle, toaster, cafetiere, cutlery, glass, china, utensils, pots and pans, serving dishing, tea towels. Washing machine, tumble dryer, iron and board, drying rack, clothes pegs. Duvets, pillows, extra blankets, bed linen, towels, tea towels, bath mats, hairdryer. Vacuum cleaner, basic cleaning supplies including washing up liquid, dishwasher tablets, all purpose cleaner etc. Open fire and storage heaters. This popular highland farmhouse has lots of space. 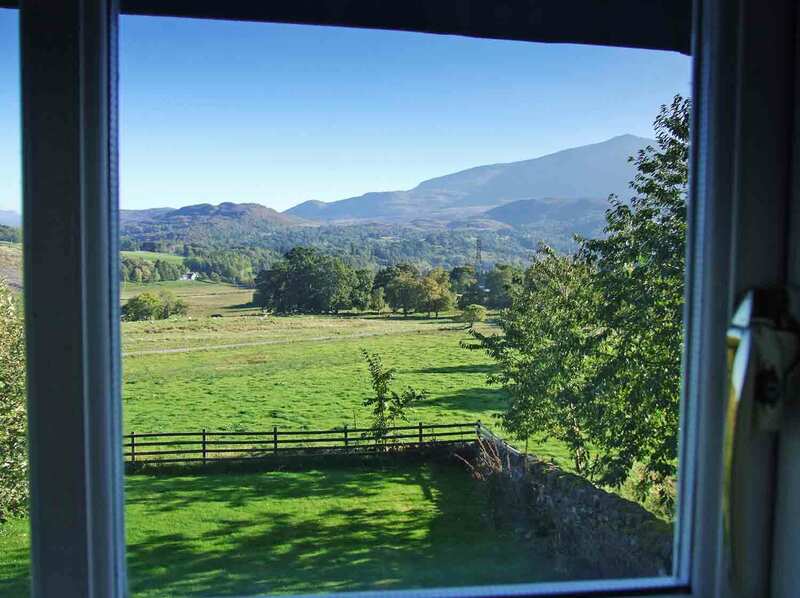 With panoramic views, it is perfect for self-catering family holidays. Standing in seclusion among meadows at the foot of Ben-a-Chuallaich, it looks across the glen to Schiehallion (1083 m). 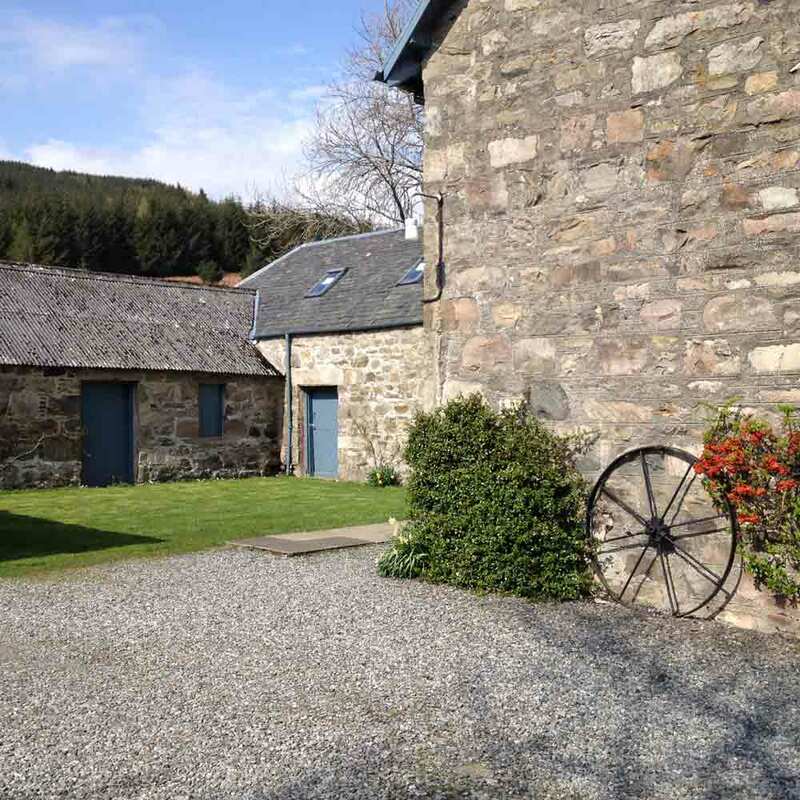 An attractive holiday home, furnished with comfort in mind, it is perfect for one or two couples or for a family. All the windows are double glazed. On the ground floor, Maragdubh has a sitting room facing south with cosy open log fire, a new sofa and easy chair and now with sofabed as well, tables and lamps. The Dining Room is spacious and has dining table and chairs, sideboards and a view south. The newly renovated galley-style Kitchen is next to the dining room and is fully equipped. The bathroom has a large bath, basin and WC. On the first floor is the large double bedroom with a kingsize four-poster bed, with wardrobe, chest of drawers and dressingtable and an en-suite shower room. This room has a wonderful view south. The large triple bedroom has three single beds (two can be converted to a superking), chest of drawers and a wardrobe. It has the same wonderful view south as the double. As mentioned above, there is now a sofabed in the sitting room which turns into a small double bed. The mattress measures 113cm W x 185cm L.
Heating is by storage heaters/smart electric radiators and cooking by electricity. All included in the rent. The garden is enclosed so suitable for dogs. However, there are sometimes sheep and cattle in the surrounding fields so care should be taken that dogs don't escape. If there are cows and calves in the field, dogs should not be walked down the drive, on or off the lead, as it is unfenced. The garden is enclosed with lawn and tubs and daffodils in spring, and roses are trained up the walls of the courtyard at the back. There is wooden garden furniture on a paved area. Deer, black grouse, buzzards and other wildlife can often be seen in the surrounding area. At the end of April the surrounding fields are usually full of lambs. A free fishing permit is included so you can fish for trout or pike on the river and, on Dunalastair Loch (a short distance away by car), where you can fish for trout only. Boat fishing only on the loch. See Fishing for details. Maragdubh triple room has three single beds, two can be made into a superking.